Carole King, the chart-topping music legend, was an ordinary girl with an extraordinary talent. She fought her way into the record industry as a teenager and sold her first hit, Will You Love Me Tomorrow, when she was just seventeen. By the time she was twenty she was writing number ones for the biggest acts in rock ‘n’ roll, including the Drifters, the Shirelles, Aretha Franklin and the Monkees. But her greatest challenge was to find her own voice and finally step into the spotlight. 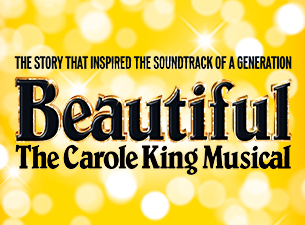 BEAUTIFUL is the untold story of her journey from school girl to superstar; from her relationship with husband and song-writing partner Gerry Goffin, their close friendship and playful rivalry with fellow song-writing duo Barry Mann and Cynthia Weil, to her remarkable rise to stardom. Along the way, she became one of the most successful solo acts in popular music history, and wrote the soundtrack to a generation, with countless classics such as You Make Me Feel Like a Natural Woman, Take Good Care of my Baby, You’ve Got a Friend, So Far Away, It Might As Well Rain Until September, Up on the Roof, and Locomotion.